A simple dust and an occasional use of the appropriate polish should suffice on most types of wood. If you do have stains to remove, wipe them up. Never attempt to remove a stain from any piece you think may be valuable; have it professionally res­tored. Always test cleaning agents first on an inconspicuous part of the wooden piece of furniture. Mop up quickly, then rub the wood with the palm of your hand to add some of your natural oil back into the wood. Then mop with a little teak oil, furni­ture polish or some linseed oil, depend­ing on the wood. If the stain is still there, rub with a paste of vegetable oil mixed with cigarette ash. 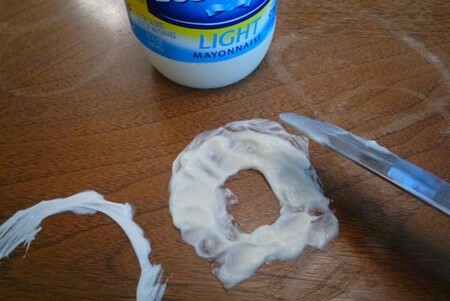 Remove the paste and rewax. Sandpaper the natural wood surface and swab carefully with hydrogen per­oxide. Rinse afterwards. Blood is un­likely to stain a treated surface. Remove the finish with methylated spirit. When dry, recolour the wood with a proprietary wood stain, wax crayons or shoe polish. Repolish the entire surface. If the surface is oiled wood, rub with teak or linseed oil, not furniture polish. If there has been a hole burnt into the surface, lightly sandpaper the area and then rebuild it with plastic wood or coloured beeswax before repolishing. Fill the hole with a wet rag and leave for a few hours. Or cover the dent with a damp cotton cloth and heat it with the tip of a warm iron until it steams. When the wood has dried re-wax or polish the surface. Remove glue by rubbing with cold cream, peanut butter or vegetable oil. Soak up excess fluid with a damp cloth and then dab the stain with lemon juice. Repeat until the stain has been bleached out thoroughly. If paper has stuck onto your wooden surface, cover it with vegetable oil, leave it for two hours and then remove it. Rub scratches with wax crayons/shoe polish/eyebrow pencil or any waxy sub­stance you can think of – as long as you match the colour. For ebony, use black; for mahogany use dark brown, and for oak and pine use white or pale brown. For walnut, rub with the meat of a fresh walnut. 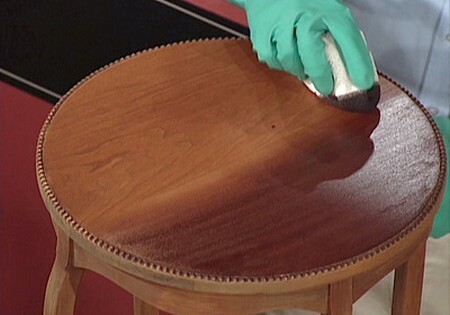 For red mahogany, paint iodine onto the scratch with a fine brush and re-wax the surface once dry. For maple, dilute the iodine with alcohol and re-wax once dry. Rub in the direction of the grain with fine steel wool dipped in vegetable oil or use a paste of oil and cigarette ash and then buff with a damp cloth. Or apply an equal solution of linseed oil and turpentine. Leave for two hours and then remove with vinegar.